It can be a little painful to look back on old posts with photos that leave much to be desired, but at the same time, it confirms your improvement and perseverance. This is hands-down one of my most favorite salads ever. There is just something extremely delectable and intriguing about jazzed-up seafood on an equally tasty salad; this Harissa-Spiced Salmon Salad With Sweet Curry Vinaigrette is another fave. This one keeps things pretty clean and simple, and the homemade toasted sesame dressing gives you a punch of flavor without having to drown your salad in it. That aspect alone deserves a high five, because salad can be pretty bland with a not-so-punchy dressing. I love the tidbit of heat that the chili flakes bring to this dish, but that’s completely optional. Feel free to omit the chili flakes if spice isn’t your jam. Like with any salad, the type of veggies you use is flexible and entirely up to you. I don’t like chunks of carrots in my salad, but I still like to include them — so I grate them! I also add julienned radishes and cucumbers, and a bit of crunchy mix sprouts which includes adzuki, lentils and peas; again, totally optional. Always keep an eye on sustainable seafood. You can refer to FishWatch for reliable information and updates on sustainability. This clean and refreshing salad is full of toasty + sweet flavors with a wee punch of heat. Put all of the dressing ingredients into a small bowl and whisk until completely blended. Set aside. Place your vegetables into a bowl. Heat 1 tablespoon of toasted sesame oil in a small pan over moderate heat. Carefully place the shrimp into the pan. If the pan spits too much, lower the heat. Evenly sprinkle the chili flakes over the shrimp. Do the same with the sesame seeds, kosher salt and ground black pepper. Toss the shrimp around in the pan/flip them over until completely cooked/pink. Careful not to overcook them. Once the shrimps are cooked, remove from heat and set aside. Drizzle the vegetables with the dressing. Toss to coat. 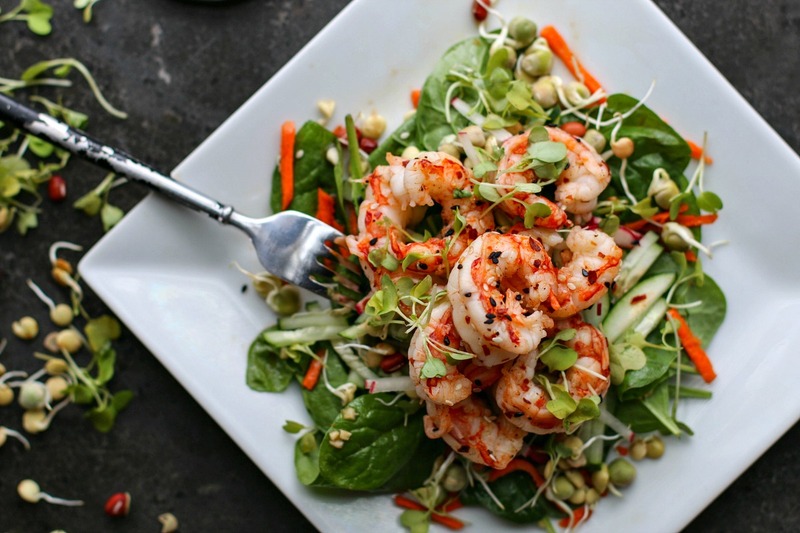 Plate the salad and top with the shrimp. Thanks, Annemarie! It's definitely been my go-to lunch for the last few days. You get your veggies and your protein, AND it just happens to be healthy and delicious. Win/win! This salad looks perfect for lunch tomorrow. Good thing I have all the ingredients in the fridge! Don't you love when that happens? I really hope you enjoy it! Oh. My. Yum! This looks like the perfect salad. Thanks, Sara! It's definitely my favorite and my go-to at the moment. This salad is fresh to the MAX. Love it!! Beautiful colors too. Thanks, Brandon! And they say you can't make friends with salad.... pfff! This looks like a salad that I will totally love! But to be honest, I probably will be attacking the spicy shrimps most of the time! Haha!